WISER was pleased, for the second year in a row, to host the Innovations in Minimally Invasive Gynecological Surgery conference, which was sponsored by theAmerican Association of Gynecologic Laparoscopists (AAGL). Together the staff at WISER, Dr. Ted Lee, Scientific Program Chair of the AAGL, organized this weekend course for gynecologists and gynecologic surgeons around the globe. Many commercial vendors in the surgical marketplace, including Olympus/Gyrus, Integra Life Science, Ethicon, CareFusion, Storz, Covidien, Cooper Surgical, Stryker, and Thermadex, participated as well. This was a two day course which provided gynecologists with a solid foundation in advanced minimally invasive pelvic surgical techniques based on sound, safe, and anatomical surgical principles. During several presentations, didactic sessions, and hands-on instruction by expert minimally invasive gynecologic surgeons, attending gynecologists strived to not only refine their skills, but also develop new ones. The content of the course was especially applicable for gynecologic surgeons who want to develop the necessary skill sets for performing various types of laparoscopic hysterectomies. There were also several demonstrations from exhibitors employing various cutting edge technologies in laparscopic surgical equipment as well as various energy sources and their application in gynecologic surgery during the two day course. Advanced educational techniques were also demonstrated. 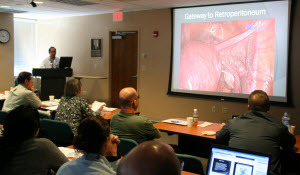 Some of the course material included practical applications of pelvic anatomy in devising surgical strategies and minimizing surgical complication, the surgical techniques and principles of laparoscopic total and supracervical hysterectomy, laparoscopic suturing, and instruction and performance of extracorporeal knots, intracorporeal knots, slip knots, and the use of barbed sutures. The course concluded on June 11th with live surgery observations at Magee Women's Hospital of UPMC. WISER was extremely honored to host this important and innovative conference.